hi i am so grateful to have just out of the blue decided to enter the ebay contact info because had i not i would be out the only money we have saved up for a car which we are in great need of.i found this woman on craigslist. i wanted to know how many miles it has? and where its located? My name is Janice Rallston I am emailing you regarding the 1999 Audi A4 Turbo Quattro that I have for sale.My car is in perfect condition , with no need for additional repairs, no scratches, dings, special marks whatsoever, never been involved in any accidents. The interior looks great (NO SMOKING). It has 99,487 miles , Manual transmission , 4 Cylinder Engine, gasoline. I have a clear and clean title for it , no liens or loans ready to be signed and notarized on your name.I'm selling my son's car, who died in Iraq four months ago and I want to get rid of it asap because the sight of it makes me think of him often and often and the pain is too great .Put yourself in my shoes and you'll do the same (selling the car of your dead son, no offence)As you probably noticed , the final price that i want for this car is $1,900.00 if you will buy it today or tomorrow . Let me know where are you located and any other details you need about it. well janice im sorry to hear about your loss, im a mother myself, i cannot imagine losing my daughter, your family is very brave. I live in bloomington, california but my husband would be the one picking up the car if we were to buy it, where are you located? First of all I will need your full name and shipping address so I can register the transaction with eBay. Once you receive the details from eBay, the car will be reserved for you until you read the details and decide if you want to proceed or not. You will have a 7 days inspection period, after the car arrives at your address to make sure it is as shown in the photos and in good working order. If by any reason the car is not as described or if you find any problems with it, I will arrange to ship it back on my cost. eBay will hold the funds until the inspection period is over and you decide if you're going to buy it or not. This way you're not going to pay for something you haven't seen and with the inspection period you can make sure it's as described. If you agree with this terms please reply with your full name and address so we can get the ball rolling. my husband would like to contact you is there a number we can call? I have just moved here and I don't have a phone as I am still waiting the green light for my personal documents as a resident here. I am not allowed to install a phone or to buy a mobile one without those papers. and how will we go about doing this? 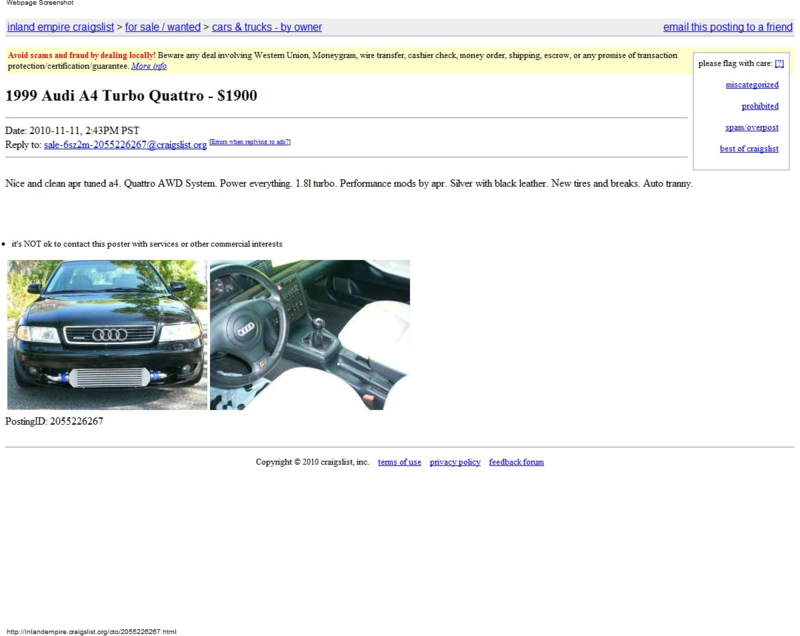 The car is not listed on ebay we are just using there services for a fast and safe transaction for both of us. Nov 13 :) You should go the nearest office of western union with $ 1,900 and put money on the name of the agent was chosen to represent the transaction from our ebay Well as you know i recieved a so called invoice. I have seen the money transfer warning and had gotten the idea to find that car on ebay since they said it was what they used. i came up with an ebay listing for that car with the same pictures but it was in CT at a parts shop for 7,900.00 buy it now. i contacted the auction already about the craigslist posting which im confident they know nothing about.